Okay…so we got a discount code for Hello Fresh. To be honest…I wasn’t a big fan of it due to cost, but with the menu selections that were available, I found this recipe for Korean Beef BiBimBap. I love this recipe, and the ease of preparation presented. I was able to cook to the recipe, and add the amount of spice that was good for me. I love that! It was authentic tasting, and perfect for the home cook. Bonus for me: David is not a fan of Korean food (although, after tasting this, he did agree that is good! ), so I ended up making four (4) dishes of this. FOUR! Lunch and dinner with four servings…love my gastric sleeve! And Hello Fresh!! I now have a good, simple recipe to replicate with my own ingredients (simple ingredients) that I can find at the grocery store. Have you tried a home delivery package such as Hello Fresh? Thoughts? A quick pickled radish with carrots for added sweetness…wash and slice the radishes. I bought already sliced carrots (I know). Bring to boil, (1) one cup rice vinegar, (1) one cup water, 1/2 cup sugar, and a good pinch of salt. Pour over radishes and carrots in a glass dish. (Please be careful doing this…) I let mine cool on the counter then refrigerated for several hours. I like them crispy and tangy. Serve with Korean dishes or with any side dish. I like to have them with a boiled egg. Placed the marinaded beef in a Ziploc bag and placed it in the refrigerator for 4 days (due to time management and other things going on –we didn’t cook). So, when we finally decided to cook…ha. I sauteed the carrots, and onions until cooked. Then seared the steak (one to two minutes per side). Topped the beef with sesame seeds, and served with the cooked onions and carrots (also sliced some green onions for extra flavor and crunch). Served with the Kimchi Radish, and some Thai pickles. David had his over rice. The beef was super tender (as it should be just with the cut of beef), and then marinating for 4 days – ugh. But the flavor was amazing, if I do say so myself. I so will be cooking this again. I will say that I need to cook the onions on higher heat with more soy sauce? Not sure but overall super yummy, and it satisfied my cravings. I had this Kimchi powder mix and rice wine vinegar… so I sliced some radishes and added some of the powder mix. It was a quick marinade, tangy and not too spicy. I really enjoyed it. If you like Kimchi, you can find powder mixes at your local Oriental market. Mix it with some rice wine vinegar and your favorite vegetable—Kimchi! I have been craving Korean BBQ for a while now, and decided to give it a try making it at home. Part of my goals/weight loss is cooking more at home. I found a couple of recipes, and combined what I thought would be good. David and I loved the marinade, and will make it again. Whisk together the marinade: In a large bowl, combine the soy sauce, mirin, rice wine vinegar, sesame oil, pear, onion, garlic, ginger for the marinade. Whisk until the ingredients are well-combined. Marinate the steak for 20 to 30 minutes: Cut the skirt steak into 2-inch wide strips. Add the strips to the bowl of marinade and stir until evenly coated. Marinate the strips of beef for 20 to 30 minutes at room temperature. Cook on a grill or stop top grill with the pan at a high heat setting. This cooks quickly, so be careful not to burn. To serve: Sprinkle the beef with sesame seeds and cilantro or mint, if using. Serve with rice, kimchi, nori, and gochujang. We did roasted mini peppers and purple onion. David’s plate, served over rice. My plate. Lots of peppers and not so much meat. This so satisfied my craving for Korean. Like I said earlier, we will make this again! So yummy. Need to change the meat as the flank steak gets a little tough. Marinade was spot on. Dinner out last night with Carmen. 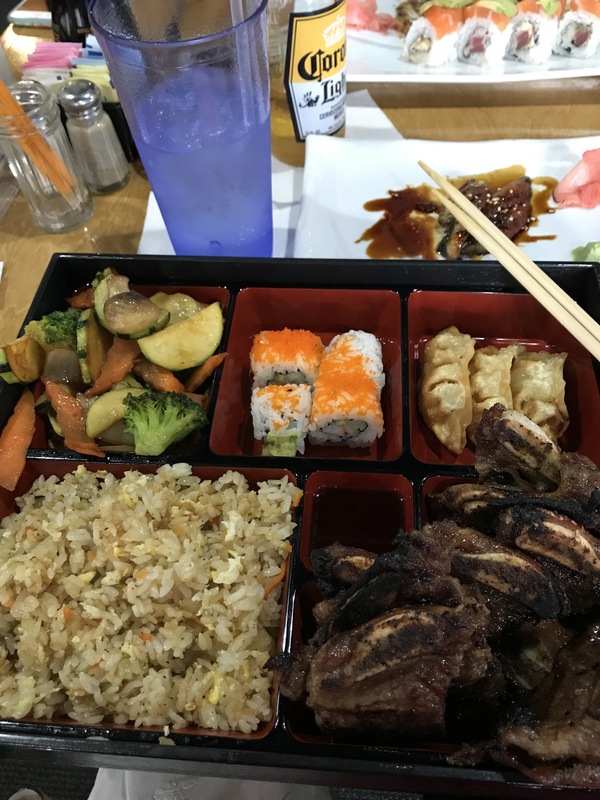 She had sushi (I can’t have the rice), and I ordered the Kalbi. I so need to learn how to make this. I ate three of the BBQ ribs, and a couple slices of carrots. Lots of leftover rice, vegetables, and sushi for everyone else. I will enjoy the leftover ribs for at least a couple of days.